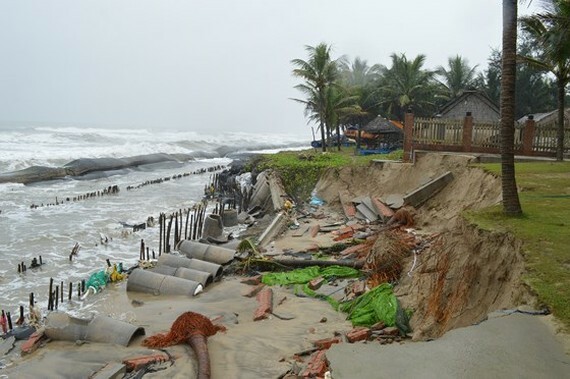 Serious erosions along the coastline in the central city of Da Nang and Quang Nam have been caused by heavy steady downpours and high tide. Streets Hoang Sa, Vo Nguyen Giap, Truong Sa in Da Nang City were eroded; subsequently, restaurants in beaches Sao Bien and Son Thuy in Da Nang’s Ngu Hanh Son District have gone out of business. Heavy rainfall washed away row of coconuts in coastline resorts. According to weather meteorologists, Da Nang City will suffer heavy downpour in two days more. People are warned of landslide and flash flood in mountainous areas and low-lying areas in districts Hoa Vang, Lien Chieu and Ngu Hanh. Worse, seawater will erode the shoreline in districts Ngu Hanh Son and Son Tra. Cua Dai beach in Hoi An City has seen erosion of 200 meter section in front of Hoi An hotel in Cua Dai Street after being reinforced. Some five meter erosion has paralyzed business of ten restaurants there. Deputy Chairman of Hoi An People’s Committee Nguyen The Hung said that the committee will work with the Department of Agriculture and Rural Development to strengthen eroded sections. It will adopt new techniques to make new embankment in the hotel.